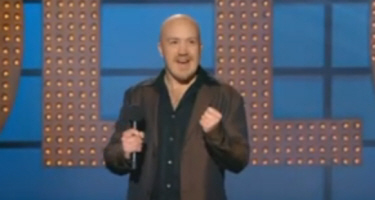 Here is a collection of comedian Andy Parsons quotes and clips. You may have seen him on ‘Mock The Week’, ‘Live at the Apollo’ and making various other TV guest appearances. He also does live stand up shows (read our review) and has a DVD titled Britains Got Idiots. Focusing on political subjects Andy has a very unique and natural style as you can see in the video clips below. Here are some good short vids of the man himself in action. Brilliant clip of Andy fluffing a joke, the crowd does its best to wind him up! Is this your bag? Clip from Mock The Week. Watch out for more great content by Andy in the future. Don’t forget to also read our review of one of his live performances in his 2009 tour, and checkout the Britains Got Idiots DVD as well, links at the top of the page. Copyright: Picture used at top is a screendump done by ourselves from a video.